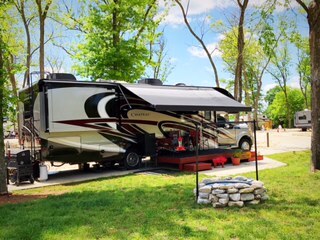 Escape the crowds and explore Grand Lake o' the Cherokee's in Northeastern Oklahoma at Crooked Creek RV Park. We are just minutes from a vast array of Grand Lake, Oklahoma attractions including the Pensacola Dam, the rugged terrain of rock climbing and hiking just below the dam, fabulous local restaurants, the Saturday morning market, and so much more. Offering you one of the best RV Parks at Grand Lake, Oklahoma.